Finding a healthy vegetarian cafe in Tokyo is always exciting. For a city with so many different types of cuisines, it is surprising that vegetarian/vegan cafes are few and far between. While Japanese cuisine boasts tempura, tonkatsu, and deliciously fried things you can eat, its use of seasonal vegetables is always underrated. So if you’re in the Omotesando area and want a vegetable-ful lunch set, I highly recommend Brown Rice Cafe. Popular with the office ladies, Brown Rice Cafe has a simple menu: vegetarian curry, steamed assortment of vegetables, and the Daily Special. Since it’s the cafe branch of Neal’s Yard and Remedies, you can pop over next door for some organic skin care shopping after your meal! 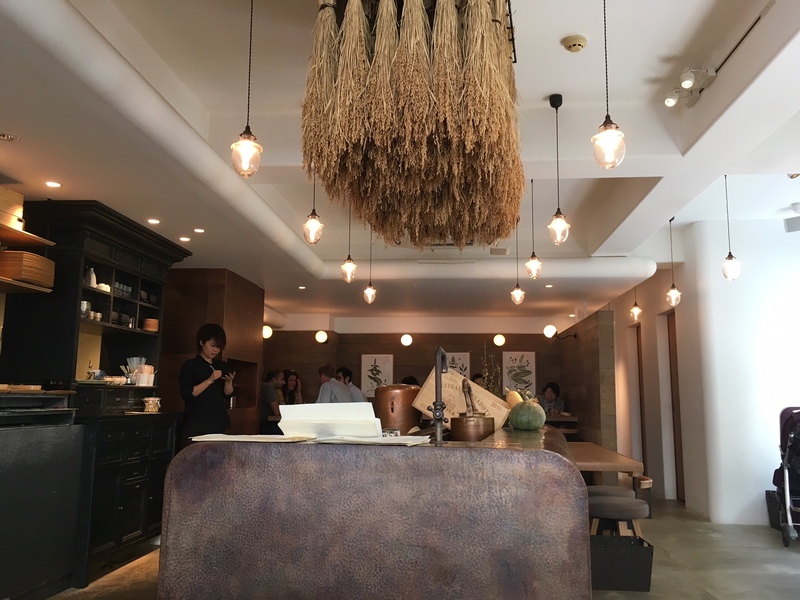 Brown Rice Cafe is tucked in a small street behind Omotesando Hills. After remodeling a couple years ago, Brown Rice Cafe has a super warm and hipster feel! Watch the food being prepared with the lovely open kitchen. The Daily Special–an assortment of mixed vegetables, miso soup, tsukemono, and the cafe’s signature bowl of brown rice with sesame powder on top. Fittingly, the cafe serves a really good bowl of brown rice–the grinded black sesame on top adds a great touch. Finish your meal up with tea and a little granola nibble. The Cafe is quite spacious with communal tables for solo diners to enjoy a casual afternoon. If you walk past the cafe on the right, you’ll find Neal’s Yard and Remedies tucked behind. Highly recommend getting the Daily Special–it’s a great mix of seasonal vegetables and getting a sample of different Japanese seasonings. You’ll walk out feeling energized for some shopping afterwards. Harajuku is the more colorful fashion hub nearby if you’re not feeling like Omotesando’s up-scale name brands. I cannot believe the year is ending already! I’m in Singapore this holiday season, but I’ll be posting an year end review soon. I’m taking all suggestions for Singapore, so send them my way please. Happy Holidays all!